The ZeroTech SS is a third-party controller released by Hori for the Sega Saturn in Japan. The ZeroTech SS is a "steering controller", acting as an alternative to the official Arcade Racer Joystick. It is a fraction of the size of Sega's model, and is operated in a different way - steering is controller by a small wheel on the side, while analogue acceleration and deceleration is provided through "gun-like" triggers underneath. 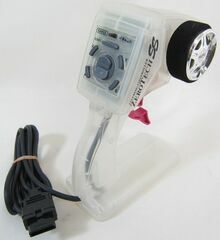 A PlayStation model, simply called the ZeroTech, was also released.